First time surfer? Experienced surfer? Maybe you have been before, but want to learn more? Well have no fear, we are here to tell you all you need to know to get in a full day of surf and sun! We sat down with ONO Surf Shop owner, James Caldwell, who gave us the low down on everything from the best surfing conditions are to what kind of boards are best for surfing in our Gulf coast waters. What are the best conditions for surfing? Look for offshore winds, Northeast to North-Northwest, combined with a ground swell. This would be optimal, but not absolutely required to just go out and have some fun. Onshore winds, southeast to southwest, are dominant at our beaches during the summer. Even when the wind is onshore, it can still be lots of fun. When is the best time of day to surf? During the summer, early morning is the best bet for offshore winds, but sometimes in the afternoon in South Walton, the prevailing ocean breeze (onshore) can switch quickly with building thunderstorms to our north. Watch the flags to see which way they are blowing. Tides also have a big impact on conditions, and experience will tell you if low tide or high tide is the best for where you are surfing. What kind of board should I use? Generally speaking, your first board should be a longboard. They are stable, easy to paddle, and easy to stand on. It should probably be at a minimum at least a foot and a half taller than you are. Once you gain enough experience on a longboard, you can experiment with some of the many different boards. However, I suggest always keeping a longboard on hand if you live on the Gulf Coast. What’s the best swimsuit to wear for surfing? Quality boardshorts are your best bet. Boardshorts have no mesh liners for a reason. Liners catch sand and create rashes. If you need to wear something under your boardshorts, opt for a pair of compression, or rash, shorts. A good lycra rash T-shirt will protect you from the sun and also a rash on your upper body that can be caused by contact with the board. Keep your eyes open and your mind sharp, and stay alert. The gulf can be great fun, but it’s not a swimming pool, and there are inherent risks. You can minimize these risks by not surfing alone. If you are surfing in a remote area, make sure you have a good first aid kit with you and a way to contact help if needed. 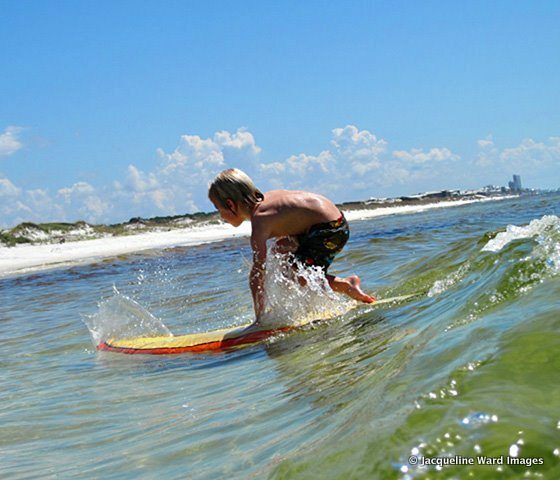 Make friends with an experienced surfer — there are plenty of them on 30A — and learn from them. Follow 30A on Facebook and Instagram. The post A Surfer’s Guide: Catching the Best Wave on 30A appeared first on 30A.